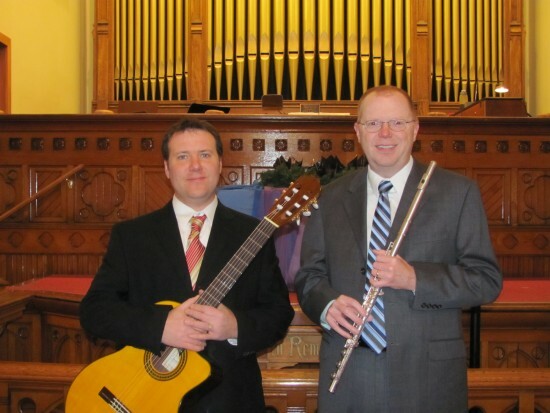 The Glaston Duo is a flute/guitar duo that specializes in weddings and cocktail hours. We offer flute, clarinet or sax with guitar, piano or organ. We are professional and easy to work with. We'll help you make your event one to remember! I am a Wedding Planner/Coordinator who was asked by a client to find a Duo for their wedding ceremony. The Glaston Duo was wonderful to work with as the planner and I will quote my client. "The Glaston Duo are very nice, they arrived much earlier than 1:45pm, and their music is exceptional." Thank you very much as you make a planner's happy to see that kind of review! Thank you Tina. It was a pleasure working with you. I hope our paths cross again! We are very customer friendly and flexible. We have worked in tuxes, suits and even hawaiin shirts! We can play indoors or outdoors. Small intimate affairs all the way up to large halls. The Glaston Duo specializes in weddings and cocktail hours. We play classical music and light jazz. We offer flute, clarinet, sax with guitar, organ or piano. We are reasonably priced and can play any music for you. We look forward to working with you to make your event one to remember.